For readers who may be Japanese-impaired, as I am, the above title is translated “School for Sparrows.” It is the name of a very successful summer school program held at our community center in the San Fernando Valley. 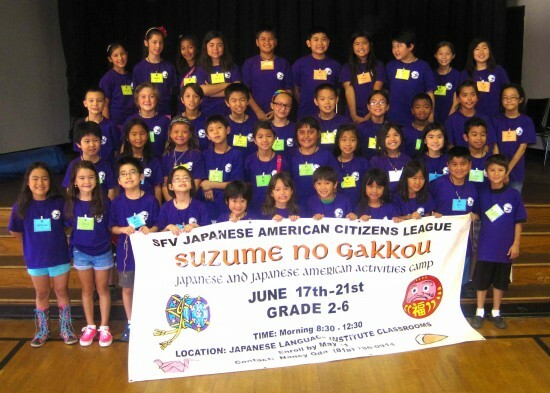 It is a week-long agenda staffed by a group of JACL members for the benefit of elementary school-aged children. A very dedicated group of mainly retired teachers teach, in small groups, a variety of Japanese cultural skills such as origami, haiku writing, Japanese children’s songs, and simple Japanese phrases. Marion’s grand-niece and grand-nephew, Sofia and Cameron, were the first to sign up for the program, thanks to Marion, who helped by being in charge of the daily snacks. Their mother is Remi, who is the daughter of Akemi Kikumura Yano, the recently retired president and CEO of JANM. Sofia and Cameron stayed over at our house after the class until their mother picked them up after work. When Sofia got to our house after the first day, her greeting to me as she came in the door was “Konnichi wa.” She’s a fast learner. On the last day, they both had enjoyed the class so much they asked whether it could go on for the whole summer! At the end of the week, the children sang and performed Japanese folk dances for the residents of Nikkei Senior Garden, the assisted-living facility located a short distance from the center. Marion said it made her happy to see some of the residents join the children in some of the dances. The school was co-chaired by JACL board members, Linda Tanaka and Nancy Oda. I was impressed by the number of meetings the teachers attended in preparation for teaching the classes. Without a doubt, we teach as much by what we do as what we say. These children learned much more than the various Japanese-related subjects presented. They learned, by example, important lessons of giving of oneself for the good of others. Let me change gears a bit: As I mention above, Marion was in charge of serving the mid-day snacks. One day she told me how tasty and attractive a somen dish was as prepared by Greg Lew, the son of Genevieve and Gene. Greg had children who attend the classes. Unless we were mistaken, Greg was the only male who made food for the snack-time. Gene told me later that he has always cooked for the family, and this skill apparently has carried over to his son. In a conversation I had with Gene later, while we were on duty setting up the JACL doughball booth for the Obon, he told me when he was growing up, his father ran a laundry, and as part of employing workers, the employer had to provide three meals a day. Gene’s duties at the laundry included cooking for the workers. His story confirms what I have heard about the importance of food in Chinese culture. This behavior seems to contrast sharply with Japanese culture, where the preparation of food is left largely to women. Having said this, I recently came across two exceptions to this. While setting up the booth, I also talked to a friend, Yas Gohata. Yas said early in their marriage, he complained to his wife, Nancy, about the lack of variety in the meals she cooked. Knowing Nancy, I can about imagine how that conversation went. The upshot is that Yas has been doing most of the cooking ever since. He says when one of their two daughters, Karen or Kim, calls about a recipe, it’s Yas they ask to speak to. The other exception is another man who was, coincidentally, also on duty with me at the doughball booth. 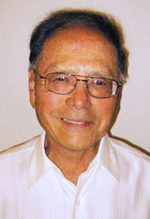 Paul Jonokuchi is a retired shop teacher for the L.A. Unified School District. He is a Shin-Issei, a post-war immigrant from Japan. Paul says he returned from school each day earlier than his wife, so he did most of the cooking, and this skill carried over to their three sons. Tragically, his wife, Nobuko, passed away last year. Fortunately for Paul and the rest of his family, they have the cooking skill enabling them to carry on. Marion says she hopes she does not go before me because of my lack of culinary skills. I assure her if that happens, I can rise to the occasion. She says she has her doubts. Phil Shigekuni writes from San Fernando Valley and can be contacted via email. The opinions expressed are not necessarily those of The Rafu Shimpo. The students of Suzume no Gakkou.